INCREASE YOUR TURNOVER TODAY WITH THIS STUNNING NEW PROMOTION! YOUR POKER MACHINE PLAYERS ARE GOING TO LOVE THIS STUNNING GAME SHOW PROMOTION! 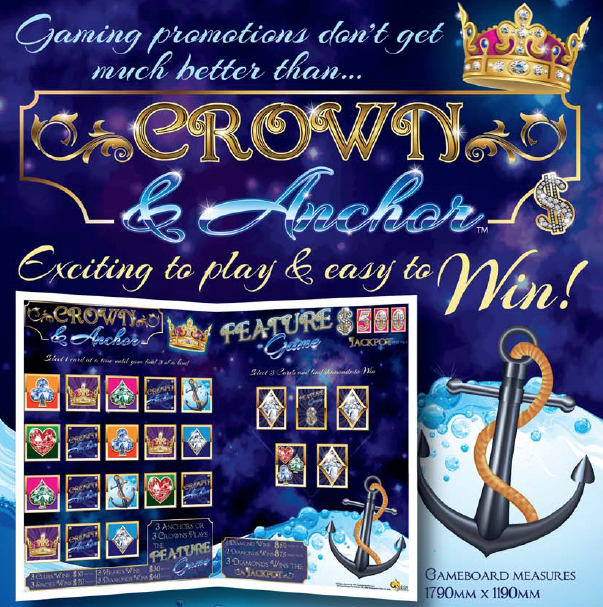 INCREASE THE FUN THROUGHOUT YOUR VENUE & PLAY 'CROWN & ANCHOR' AS A CASH GAME IN YOUR LOUNGE AREA. IT'S INTERACTIVE, EASY TO PLAY & IS A SURE FIRE WAY TO INCREASE YOUR BOTTOM LINE! KEEP YOUR MEMBERS ENTERTAINED WITH THIS UNIQUELY DESIGNED GAME SHOW PROMOTION FROM GOLDEN GAMES.